The support experience, customer service, and customer care, play an incredibly important role in a Customer's Experience of a brand. How a brand shows up when things go wrong weighs heavily on the Customer's perception of the brand as a whole. In fact, for some people...customer support is a deal breaker. At EffectUX we help our clients to attain their customer experience visions by understanding exactly what factors and attributes drive successful achievement of the experience they are delivering. Over the last few months, we have been using our approach to research the support experience. Through this research, we found that currently there are 3 key items that come up as top-of-mind when talking to Support Leaders, Support Agents that deliver the experience, and customers, which make for an environment where a great support experience can be enabled. Leadership needs to be aligned in their vision for exactly what the support experience should be that they want to deliver to their end users and customers. They need to be clear in what really is a must have, what is a differentiator, and what is just nice to have. Often leadership can pay lip service to a customer service focus, and then not back it up with the decisions, investment, and enablement's needed to deliver on it. Furthermore, leadership can sometimes focus on the wrong metrics without a clear view of the bigger picture. They can get bogged down in their own scores and dashboard colors, and forget to focus on the success metrics as they are perceived by their customers. Sometimes the very same metrics they have for "success" actually work against delivering a great experience. For example, "time to resolve" is a pretty standard metric, and of course customers like the time to resolve to be fast. However, if the Agent is strictly measured against this, they may try and solve the problem in a way that is not the most optimal or pass the problem on so that their time logged looks good - but in truth the experience was not great for the customer. What is key in these moments is understanding the customer's real experience outside of stand-alone metrics that are not in context of the total experience - and this takes purposeful efforts. The ability to link the information and the data from the total support ecosystem also came up as an important focus area and a key enabler in delivering a great support experience. In order to do this, clear decisions and investments need to be made. Making sense of the data and determining the right time to act is not easy; there needs to be clear points of progression on the organization's roadmap to put the necessary capabilities in place. Features, such as helping your Agents to understand the customer's journey to date, and helping customers to understand their best options or to be proactive in their experience, all require deliberate information gathering, analysis and delivery at the right moments. This will provide you with a lot of data, but there is no need to boil the ocean. It is worth thinking about what data would be helpful, when, to who, and for what purpose. Then you can think more clearly about how you can gather and use the data, as well as what systems or integrations may be needed. Employee experience is imperative in helping you to deliver the customer experience. How can frustrated employees deliver a fantastic experience? How can employees whose tools do not enable them to do their job effectively or efficiently work through the customer's problem and get them on their way? It is worth remembering that the companies delivering outstanding customer experiences are the ones delivering great employee experiences as well. When it comes to support, we found this was certainly true. The Agent Experience is critical and encompasses factors including their actual physical workplace, their tools, and their growth and development. Looking from the Agents perspective we found that they wanted to be sure they were providing value and really wanted to know that they were making a real difference for the company. This goes beyond just making them feel appreciated or giving them a reward. This is genuinely seeing and valuing the clear line between what they do and the company's purpose, and aligning recognition around this. You can help them by making sure they understand the company's strategy and vision, and their role in achieving it (hmmmm, go figure - the same as you should for all your employees). We also found that to be enabled to deliver the support experience, Agents needed leadership support and enablement, as well as the right tools and defined processes and procedures that enable them to uphold and implement the necessary experience. You need to enable them with guidance, but give them the authority to act as needed. We found that from the customer perspective, naturally, the speed of getting their issue genuinely resolved was important to the experience. Also weighing very heavily, in fact a differentiator for the total experience, was the people that customers interacted with. Some examples of the traits that correlated to positive customer interactions were professionalism, helpfulness, natural love for problem-solving, taking a personal responsibility for the situation, patience, good attitude, positive energy, situational awareness, and paying attention. Many of these traits are better hired for than taught. To enable this there may need to be some changes made to your hiring process. There obviously needs to be a baseline level of domain knowledge to enable new Agents to get going quickly, but if they are quick learners, they can easily be taught role-specific services, processes, and tools. In contrast, these other traits are not so easy nor fast to learn, and cannot be authentically felt by the customer through scripts. We observed that the ability to triage effectively combined with the enablement to go off-script allowed for an experience to be contextually relevant. The Agent could act as needed to truly understand the problem and determine what needs to happen for the customer's specific situation, which promoted a more personal and connected feeling. Are your leadership aligned on the support experience that needs to be delivered and what it will take to get there? 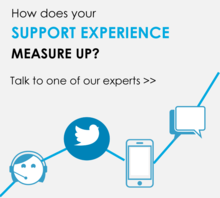 Is your Agent Experience enabling the desired support experience to be delivered? Is your hiring process enabling you to differentiate your customer service? At EffectUX we help customers successfully achieve their Customer Experience by optimizing the business needs, operational requirements and the customer experience. We work at the intersection of humans, technology, and business, using our proprietary process to discover the exact success factors and attributes that enable an environment where the desired experience can thrive. If you want to know the success factors for your experience, or one of our existing indexes can help you, we'd love to chat. You can contact us here.